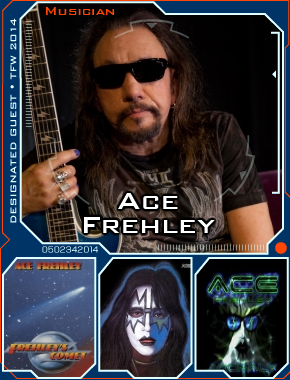 Please welcome Rock and Roll Hall of Fame 2014 inductee Ace Frehley to Texas Frightmare Weekend! Ace Frehley is the former lead guitarist for hard rock super group KISS, best known for his “Space Ace” character, on stage stagger, cackling laugh and smoking guitar effects. It’s a good year to be Ace Frehley! Not only is the legendary KISS guitarist about to be inducted into the Rock and Roll Hall of Fame, but he also has his first solo album in five years about to hit shelves. Frehley has announced that his latest disc, ‘Space Invader,’ will be released June 24 via eOne Music. Fans can look forward to nine original new cuts, plus Ace is taking on the Steve Miller Band classic, ‘The Joker.’ This will be Frehley’s first release as part of his new record deal with eOne. In other Ace Frehley news, the guitarist will be part of the 2014 Revolver Golden Gods Awards. He’s signed on to be one of the presenters, joining Zakk Wylde onstage as they reveal the winner of this year’s Dimebag Darrell ‘Best Guitarist’ Award. Frehley stated of his participation, “It’s exciting to finally be part of the Golden Gods Awards and an honor to be part of any Dimebag memorial award. He was a friend and I know everyone misses him, as do I.” The 2014 Revolver Golden Gods Awards take place April 23 at Club Nokia in Los Angeles.